ICB Softball is Number 1! 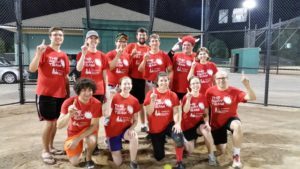 A successful season came to a close last night when the ICB-sponsored Away Team beat their arch nemesis Senior Tequila softball team 5-4 and 10-9 (in extra innings!) in a playoff double header. The Cavs have nothing on us! Go Away!! Posted in Cleveland Calculus, Jonathan Haines, Uncategorized.